These barbecue beans are easy and tasty, and the chopped multi-colored peppers make them colorful. The beans cook in the slow cooker for about 3 to 4 hours. Below the recipe, you'll find instructions for baking the bacon in the oven. There's less mess, no turning, and it cooks perfectly in about 20 to 25 minutes. Also see the tips and variations below the recipe for some serving ideas, garnishes, and possible add-ins. Fry the bacon in a large skillet until cooked, or bake it in the oven. In a large bowl combine the canned beans, brown sugar, chopped onion and bell pepper, and barbecue sauce. Empty the bean mixture into the slow cooker. When the bacon is done, drain it on paper towels and cut it into small pieces. Add the bacon to the beans. 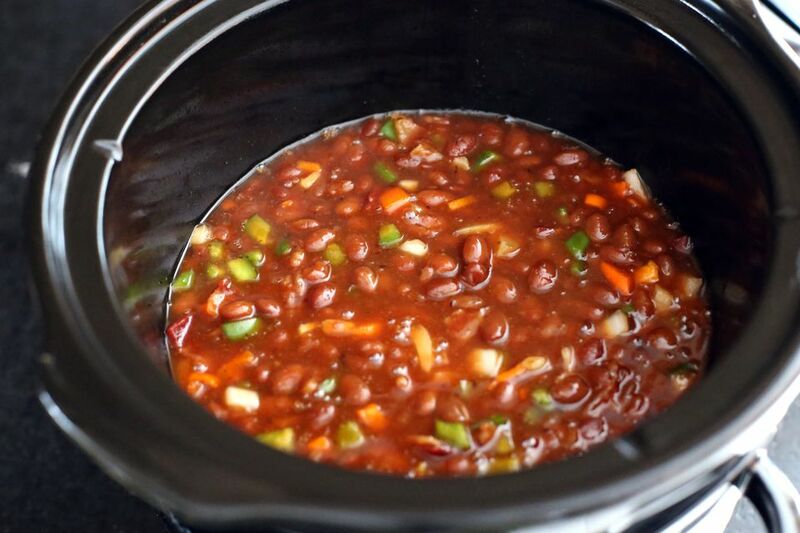 Cover and cook the barbecue beans on high for 1 hour, then reduce the slow cooker to low and continue cooking for 3 to 4 hours, or until the peppers and onions are tender. Skip messy frying and cook your bacon in the oven. Heat the oven to 375 F. Line a large rimmed baking sheet with heavy-duty foil. Arrange the bacon strips in the prepared pan. Alternatively, you can use a cooling rack in the pan. The bacon will take a little longer to cook on a rack because it isn't cooking in its own drippings. Top each serving with some shredded cheddar or pepper jack cheese, along with sliced green onion tops, if desired. Add about 1/2 to 1 pound of cooked crumbled sausage or ground beef to the beans along with the bacon, or add the ground meat and omit the bacon. Add about 1 1/2 cups of frozen (cooked and drained) baby lima beans for extra color, or add a 15-ounce can of drained black beans. Pineapple is delicious in beans. Add 1 can of drained crushed pineapple to the beans along with the vegetables. Add some heat with a chopped, seeded jalapeno pepper, or add about 1/2 to 1 teaspoon of crushed red pepper flakes to the beans.